As Harvard Business School's HBX and Boise State University work together to bring HBX's online business fundamentals program to Idaho students, their collaboration epitomizes some of the issues universities are working through in online business education. HBX is still experimenting with offerings and markets, according to Patrick Mullane, executive director of HBX. He said that when HBX was launched, it was not initially envisioned that state institutions would be partners — but given HBX's mission of expanding access to Harvard's offerings, the Boise State partnership makes perfect sense. "We think it is a great model, but Boise State has a business faculty of its own, so one question was how you make a sale to them of inserting this HBX offering." Gordon Jones, dean of the new College of Innovation and Design at Boise State, saidhe believes the future will involve integrating online offerings from world-class institutions with best-of-breed local partners. "I think public universities that aren't Top 100 ought to look hard at these kinds of collaborations. When I first discussed this with people in the business school, the typical response was 'we have people who teach accounting.' But the curriculum got glowing reviews from faculty and deans," he said. "I told them in three years I will hand it over to them, and they can make a thumbs-up or -down call." Mullane and Jones spoke at the inaugural Business Education Online Learning Summit at the University of Pennsylvania's Wharton School of Business on Sept. 20, where executives discussed how relationships are shifting between employers, business schools and educational technology vendors — and whether newcomers such as McKinsey Academy pose a significant threat. 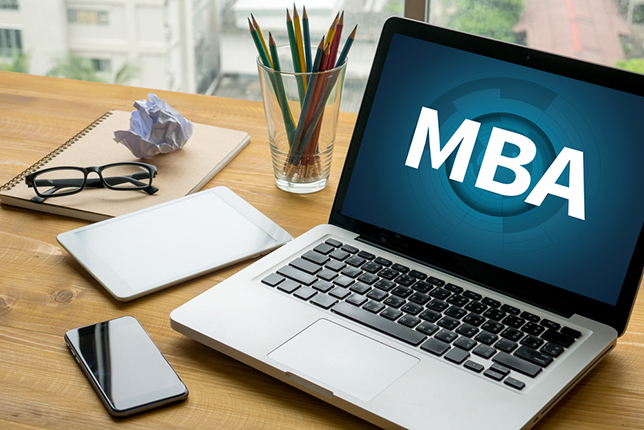 Several panels discussed how online offerings are disrupting business schools from within and without, including "unbundling" the MBA into smaller certificate pieces. Daniel Pianko, founding managing director of University Ventures, a firm that invests in education-sector companies such as coding academies, said there is a middle ground between those who believe the university is going to be disrupted into extinction and those faculty members who plan to lecture as the sage on the stage until they retire. "The growth in purely online programs has basically stopped. We do not believe purely online is the wave of the future," he said. "Hybrid is the future." One key issue: the perceived value of credentials and "micro-credentials" vs. two-year MBA degrees. Jonathan Finklestein is founder and CEO of Credly, a company that allows students to acquire share, and use credentials. He called credentials the currency of the labor market and said that the MBA is like giving students a $10,000 bill but no other denominations. "It is a blunt instrument, and difficult to make change for," he said. "We see skills that offer a premium in the workplace, and are looking for ways to verify those in bundles or individually, then creating something portable, so that employers can trust that record has value. Students could then provide evidence that goes beyond the brand of the institution whose watermark is on the credential." With an MBA, the whole may actually be worth less than the sum of its parts, according to some experts. Matthew Sigelman, CEO of Burning Glass,acompany whose algorithms analyze hundreds of millions of job postings and real-life career transitions to provide insight into labor market patterns, explained that in many cases, someone with a Project Management Professional certification can earn 20 percent more than he or she could with an MBA. "Businesses are looking for people who bring work-ready capabilities," he said. "Some of those may be getting taught only in a superficial way in MBA programs." A silver lining of the tough recession is that there is a much more skeptical consumer base for higher education, Sigelman said. Students are asking if an MBA is worth the price, and want to see outcome metrics. "There will be MBA programs that can command premium prices," he added. "Others will need to be able to better articulate value in ways they can't today." As business schools develop their online presence, they have a decision to make: whether to partner with a third-party technology platform or innovate on their own. Stanford University, for example, has chosen to create its own platforms — mainly because it has the resources to do so, reported Dave Weinstein, associate dean of executive education at Stanford's Graduate School of Business. "Innovation and experimentation are not the same things," he noted. "People innovate because they have to, because they have a gun to their head. Stanford does massive experimentation, but turning it into meaningful offerings is where the challenge comes in for institutions that are as comfortable as Stanford is." Stanford did, in fact, consider a joint venture with McKinsey Academy, "but my university was not willing to co-brand," Weinstein said. He added that if he didn't face internal constraints about partnering with outside vendors, "I would cast my lot with a number of organizations to maximize the pace of learning what works." Wally Hopp, associate dean for learning design at the Ross School of Business at the University of Michigan, noted that Michigan was one of the first business schools that partnered with Coursera, but that didn't commit the university long term. "We hedge our bets. We partner with vendors, but are not committed to any of them. If our interests diverge, we part ways." Short-term executive education programs offer a great place for business schools to pilot new technologies, said Will Garrett, associate dean of executive education at the Kellogg School of Management at Northwestern University. "We don't yet understand what works and what doesn't in degree programs in terms of when to use a blended environment," he said. "We can try a new platform in executive education and learn about its efficacy. If we mess up for three to five days, that is not the same as messing things up for two years." Jagmohan Raju, vice dean of executive education at Wharton, said the market for post-degree learning will continue to grow, and he does not feel threatened by new technology or new market entrants. "Our business is very good. The need for just-in-time learning is going to grow like crazy." Kellogg's Garrett agreed with Raju, but said the danger is that "we don't do it well enough. We don't learn to do it as effectively as we should. We are all proud of the schools we represent, but just having a class with the Kellogg name on it doesn't make it good," he said. "We have to keep pushing ourselves to advance the efficacy and better understand where online adds to the effectiveness of a class."